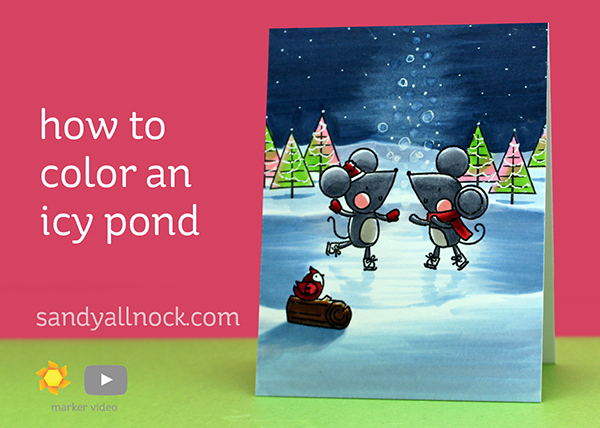 Another popular request due to all the skating stamps out nowadays….an icy pond! Watch the video below or click HERE to see it in HD on YouTube. Aren’t they little cutie patooties?? In honor of our little skating mice skating on frozen water….I’ve made a nice little donation to Charity Water – I am very conscious of the fact that we in America take our clean water for granted. It always comes out of the tap, and we can find fountains in the mall to get a quick drink, and have bottled water to keep us hydrated when we’re out. But in so many places around the world, that’s not so. Women, especially, have it hard – they often walk for miles with gas cans on their heads to transport water that has been shared with cows! 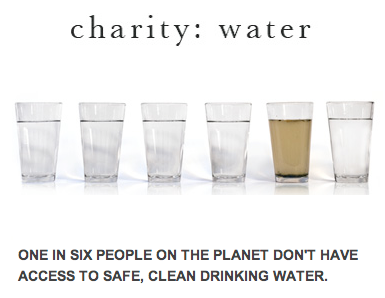 So if you had a big drink of cool clean water today….consider buying a cup for someone else too! 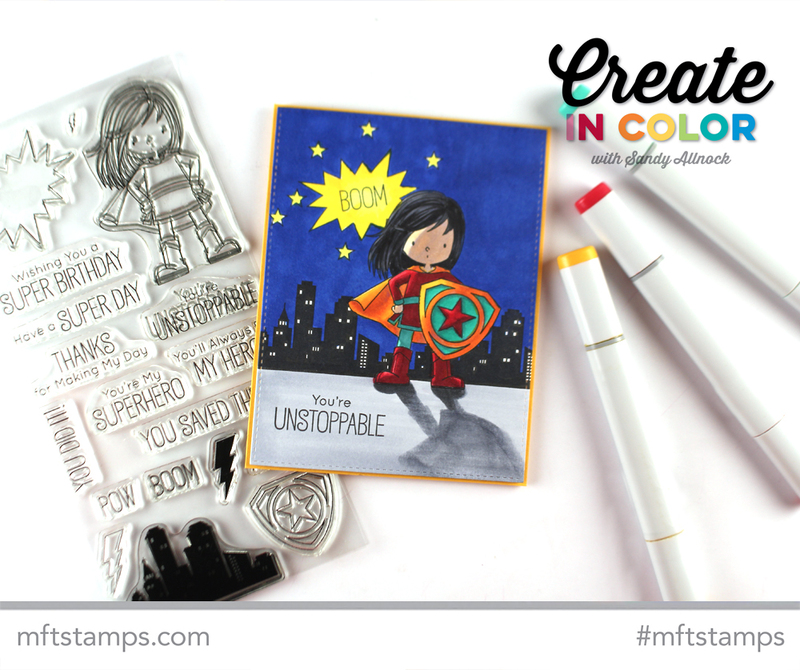 And now…head over to MFT for this month’s Copic coloring video – HERE! What a great tutorial today. I love the icy scene. I have a gorgous stamp but didn’t use it yet because its a polar bear ice skating and I didn’t know how to do the ice. So now I can give it a try, Thanks! 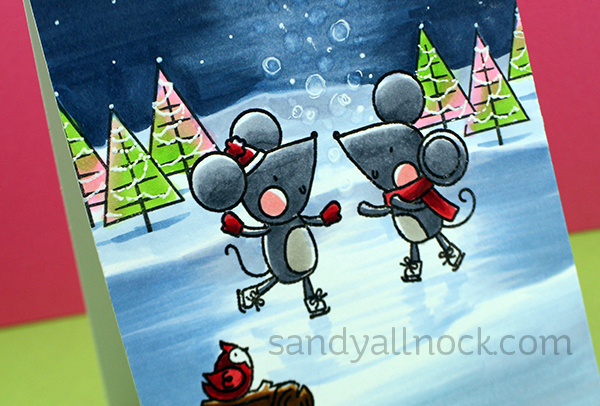 Sandy, such a cute card! I learn so much from your videos and want you to know how very much you are appreciated! Thanks for the tips on creating a skating pond. Cute card! Great video, thank you so much for sharing with us and inspiring me. I have learned so much about my coloring through your jumpstart class and all of you wonderful videos. Love it. Thank you so much for sharing your talents with us. I have learned so much from your videos. So glad I took your jump start class, it made watching your videos even more enjoying. I think it is time to go back and retake the class and brush myself up. So cute. Thanks for the colouring tips. Thank you for this beautiful card ! I’ve got this stamps set and I will try to create a iced pond ! Super COOL super girl and super charity! Oh yess, AWESOME skating mice, thanks for the video! I love all your different styles – from seriously realistic to totally fanciful! This “ice pond” technique is going to be pure fun for me to try today – thanks for another super idea.